But each provides a point of view, a frame. The models are arranged from simple to complex. 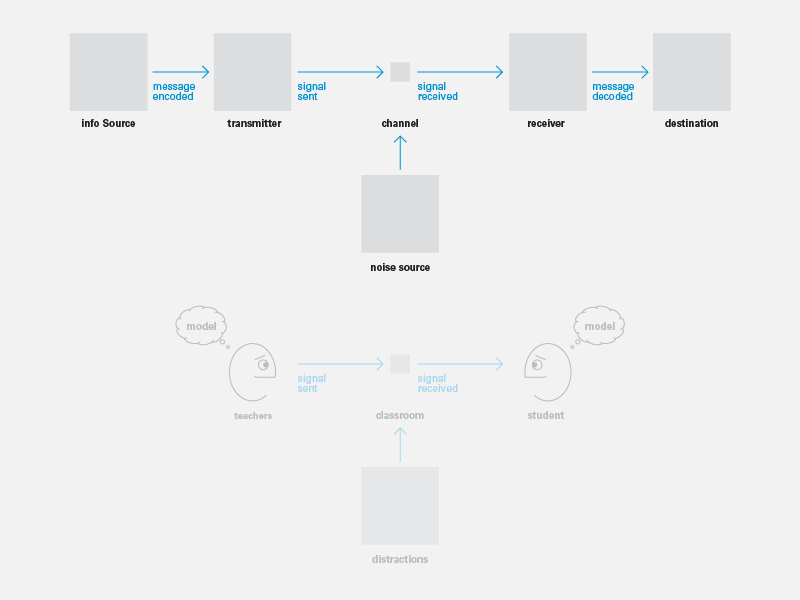 They begin with two open-loop processes. frames teaching as content delivery. 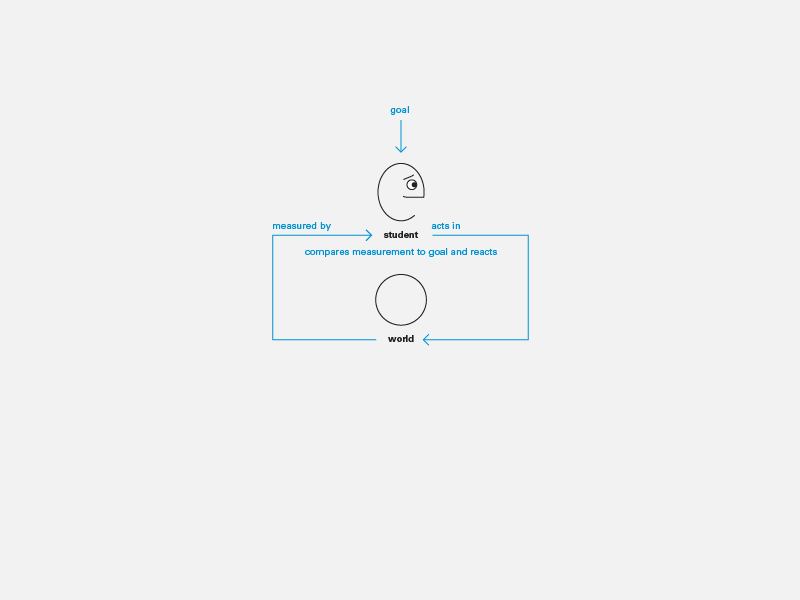 adding encoding/decoding and noise to the process. first external assessment and then self-regulation. and finally framing students as second-order systems. 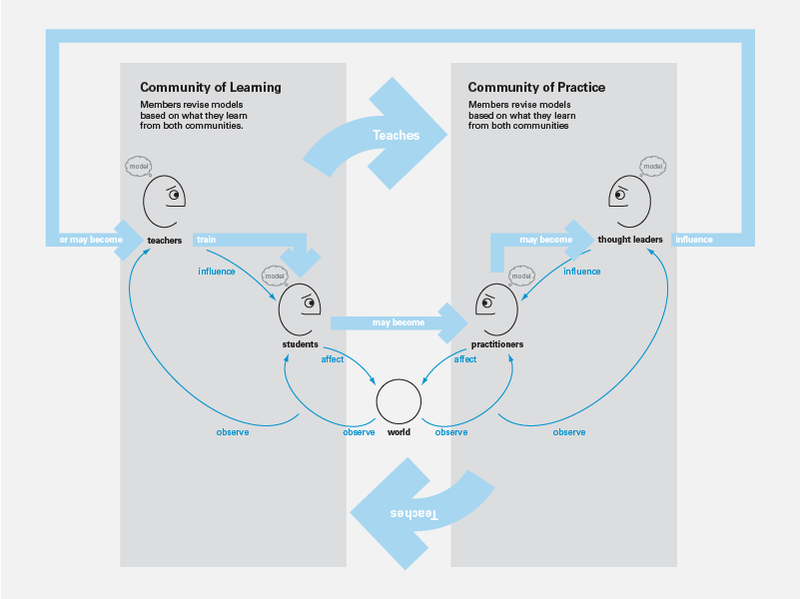 a community of learning and a community of practice. and we invite others to share their models. but that current processes of education are far from ideal. requires understanding the current state. about where we are and where we should go. This model claims that learning is simply a matter of passively “absorbing” what the teacher presents, and that every student is capable of “taking in” content no matter what the form or subject. This model separates content from teacher and implies teachers are interchangeable (likewise students). It also suggests content can be created by an author (expert) independent of teachers and students. Of course, sometimes teachers are experts. – The message may not be received. – Receiving may not be the same as understanding. – Understanding may not be the same as learning. – Students may not learn (or may not study) unless they foresee a penalty (or reward) for doing so. This model assumes sender + receiver share a common vocabulary (which makes encoding + decoding possible); but a goal of education is to expand students’ vocabularies, a process this model does not describe. 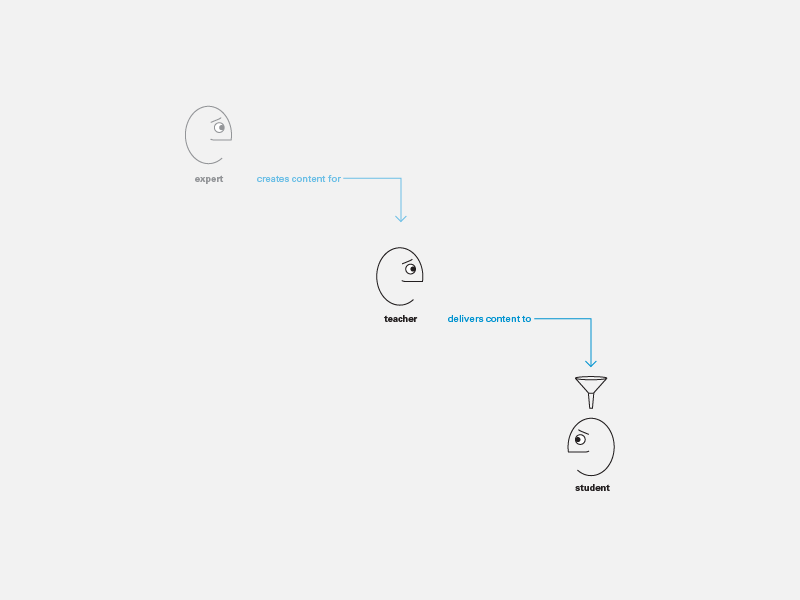 Shannon explained how adding redundancy in a message can compensate for noise in a channel. This is analogous to saying that repetition is sufficient to compensate for failure of a student to correctly decode a message. This model is like any feedback system. For example, a captain gives the order to dock the ship at port (sets a higher level goal). The pilot sets a course toward port by moving the wheel and then watching to see if the ship veers off because of wind or tide. If so, the pilot compares the current heading with the desired heading and adjusts the wheel accordingly. At a lower level, changing the heading translates into setting a new goal for the “wheel angle” (or rudder angle). This model assumes teachers have a responsibility to ensure that their students learn. Teachers organize a series of “lessons” (lectures, exercises, etc.) which lead to mastery of a higher-level “unit”. When students demonstrate competence in one lesson, the teacher then moves on to the next. SRA is an example of this model applied first to teach reading and later to other subjects. One issue with this model is that both teachers and students are accountable to agents outside the model. Students learn by acting in the world, measuring the effects of their actions, comparing those effects to their goals, and modifying their actions to bring the effects more in line with their goals. 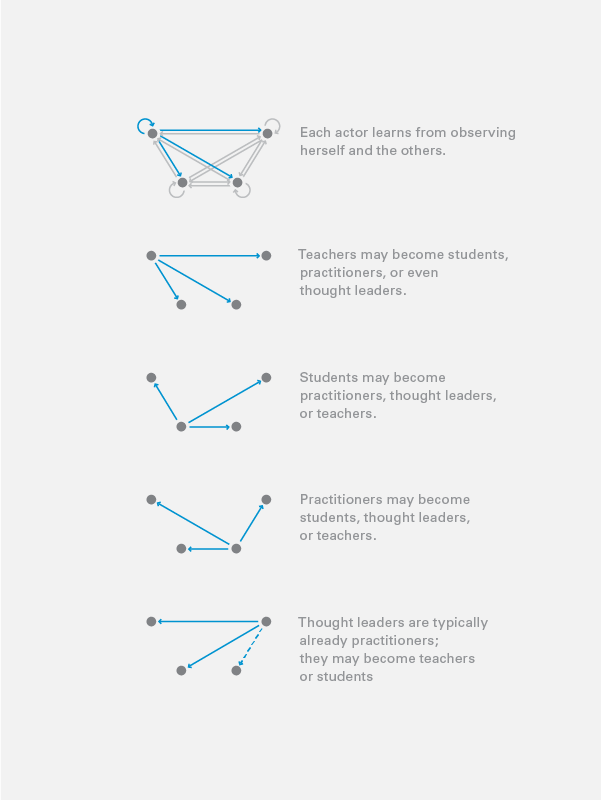 “Acting in the world” could be operating a simulation, or teaching back to the teacher, or teaching each other. This model frames students as seeking to maintain a relationship with their environment. It argues that learning cannot be “dis-embodied” and is not merely a matter of mind or an exchange of messages. However, learning is not mere regulation; a float valve does not learn. First-order systems cannot change goals or strategies. By framing learning as self-regulation, we can see its relationship to design and the creative process. Institutions are complex systems with many levels of feedback, operating across many time scales. Constituents (e.g., parents) regulate administrators. Administrators regulate teachers. Teachers regulate students. Students receive feedback on their performance from teachers and parents. Likewise, teachers and administrators may receive feedback on their performance from parents—and even from students. 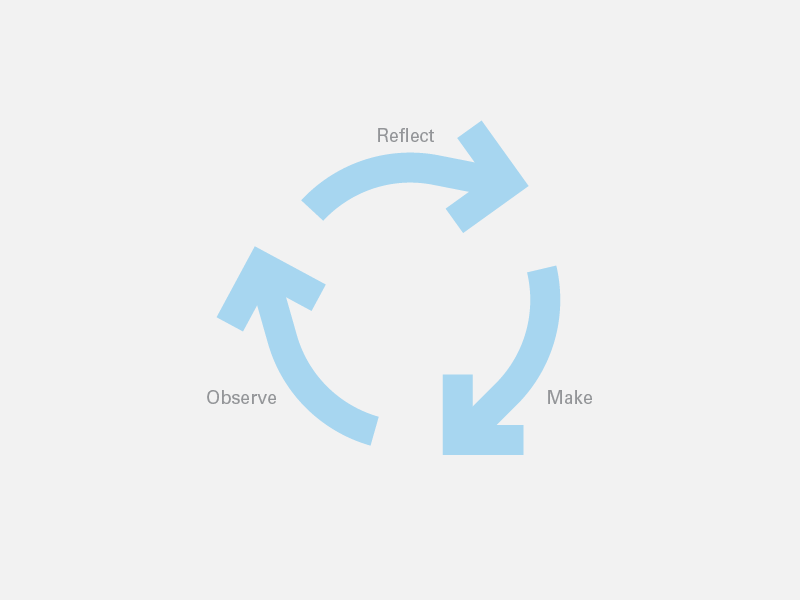 The quality cycle (plan, do, check) is a first-order feedback loop—a process used by quality teams to improve the way they implement a basic process. (Basic processes are likely to include self-regulation). 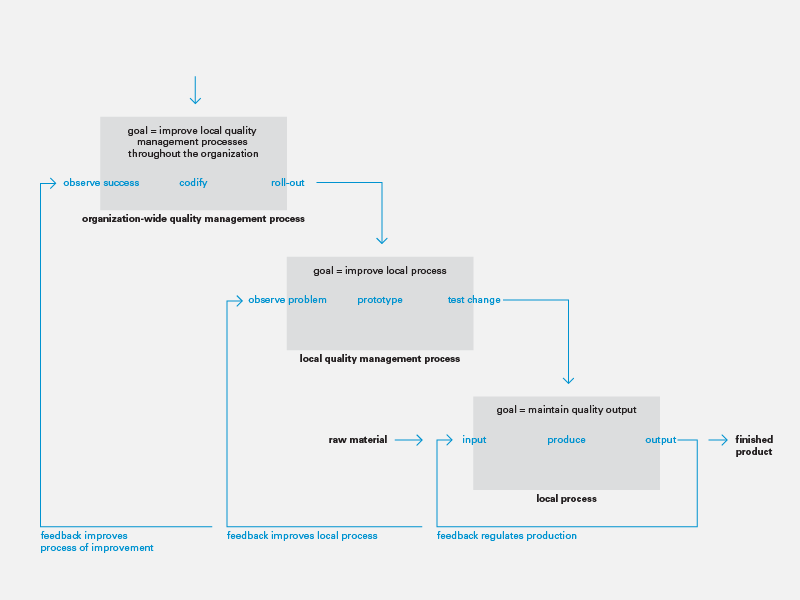 An additional process monitors the work of all quality teams; identifies local solutions and processes that may have wider value; and distributes them to other parts of the organization. Faculty seek long-term financial stability, which makes tenure attractive. Tenure requires publishing in peer-reviewed journals. Journals seek new ideas based on new research. Research requires funding, which is made more likely by previous funding, research, and publishing. Students have a mental model of themselves, a model of their goals, and a model of possible actions (process for achieving goals) which include effectiveness (how well an action achieves a goal) and efficiency (how easily an action achieves a goal). Students observe themselves acting in the world and may reflect on the value (= benefit – cost) of strategies (lower-level goals + actions) in achieving higher-level goals. In the process, they may change goals within a specific strategy or even change strategies. Reflecting on actions changes their mental models, in particular changing assessment of effectiveness and efficiency. 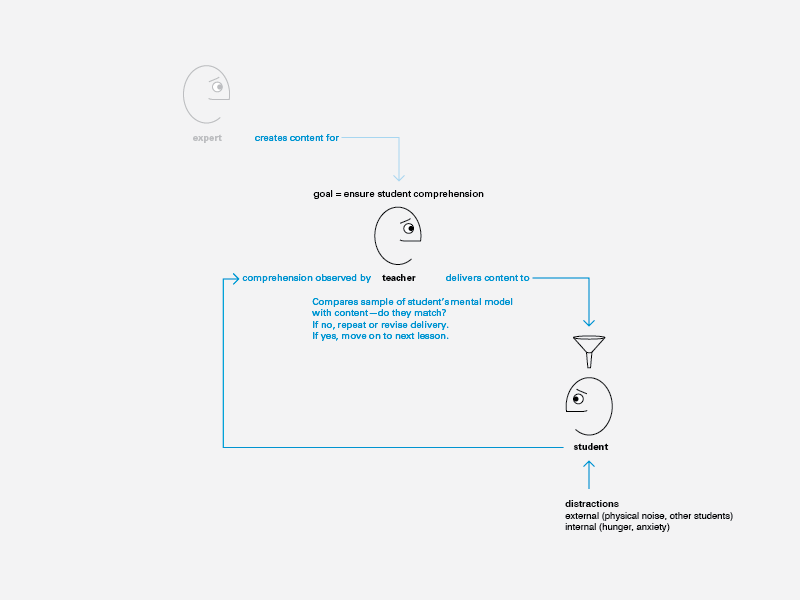 This model can describe experimenting and designing. 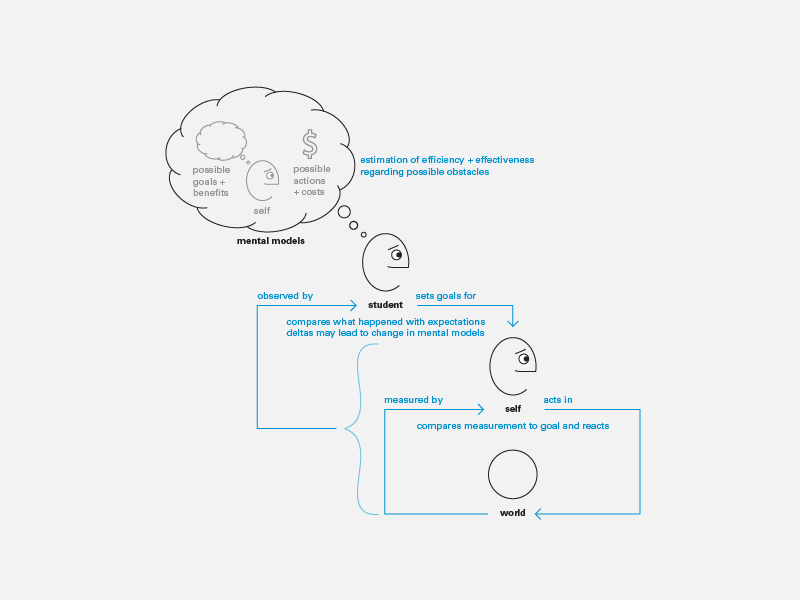 It posits learning as assessment of our actions, which causes us to revise our mental models. Much of higher learning involves conversation—sharing + testing understanding in order to reach agreement. We might argue that all reasoned learning (anything above simple stimulus-response conditioning) is based on conversation, even if that conversation is with oneself. 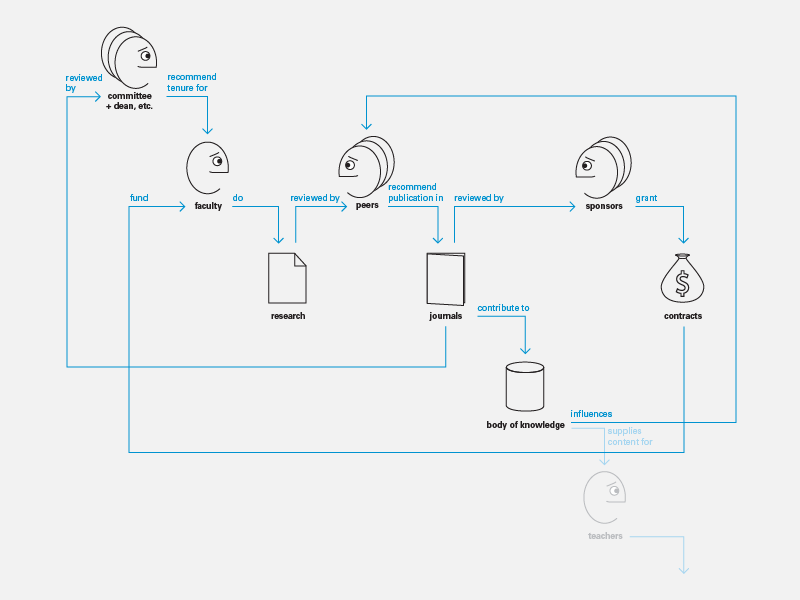 Conversation is required to understand and integrate new information into prior models. (To put it another way: Conversation is required to change beliefs, and by definition learning is a change in belief.) For example, watching a videotaped lecture requires a student to focus on the topics being highlighted by a lecturer, as well as to listen and understand how those topics interact—which of all possible aspects of each topic do and do not relate to the points being made— to create a perspective or an idea that is new to the student. The student literally re-makes the concept coming from the lecturer by taking different perspectives that would arise if it were an actual conversation wherein the student and the lecturer re-constructed how the pieces fit together. The student learns the material by consciously running through how and why the topics are inter-related to create a new, coherent, complete concept. 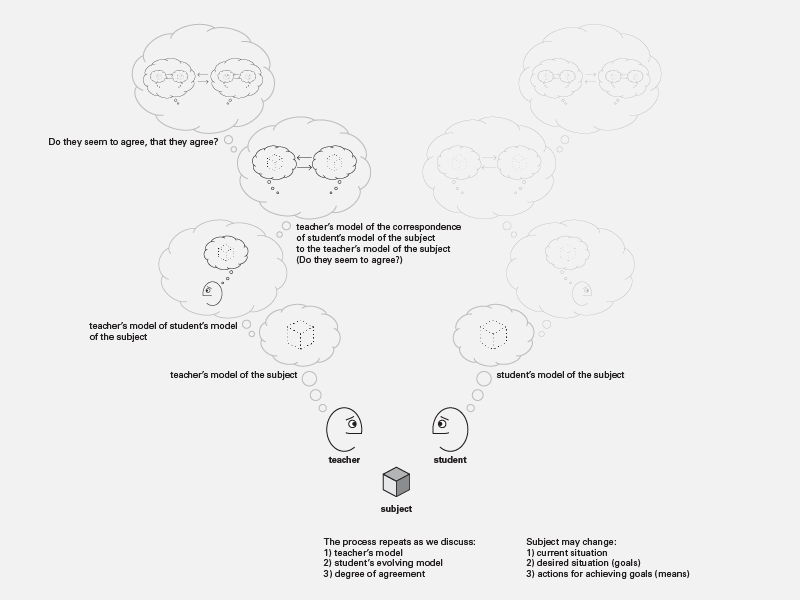 As a result of the exercising of these perspectives, the student’s model matches the lecturer’s model to a sufficient degree to say that the student “understands” the material. We might even say that mastering a discipline means entering into a series of conversations with members of the community that comprise the discipline—even if one’s access is restricted by place and time so that the conversation is essentially only within our imagination. 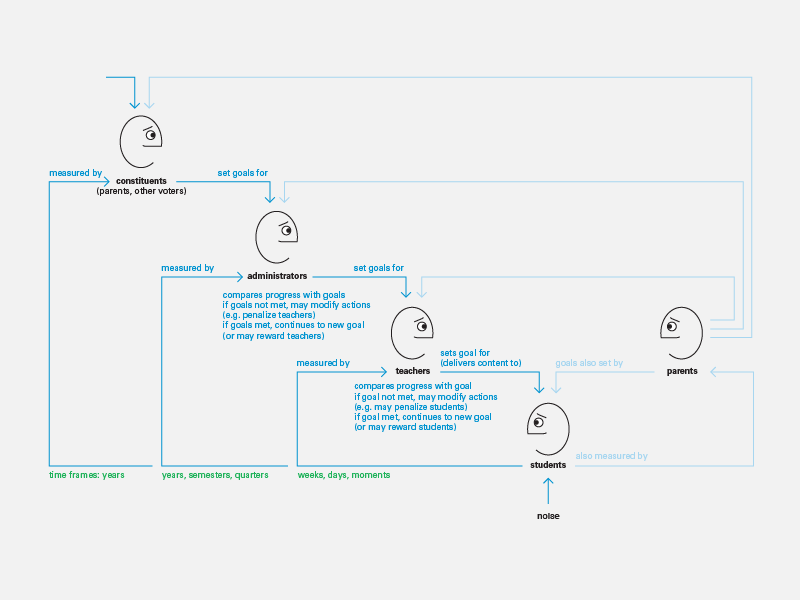 This model can describe the process by which an individual’s vocabulary grows—and the process by which a group increases the scope of language available to it (i.e., increases its “variety,” in Ashby’s terms). Students learn from both teachers and other students. Students + teachers form “a community of learning”. When students graduate, they may join a “community of practice”. In a healthy discipline, the two communities are engaged in conversation: The community of learning teaches the community of practice; likewise the community of practice teaches the community of learning. In the bigger picture, teachers are usually parts of educational systems where they can feel that syllabi are designed by people with political agendas and little idea of real-life classroom interactions. Despite this, in the classrooms, teachers are left more or less alone with their students. They can choose to focus on delivery of information, adopting, for example, methods based on Elaboration Theory, and attempt to provide definitions, examples, descriptions, activities etc that even the “dumbest” student might understand. Alternatively, they might adopt a Contructivist approach and seek to find out what their students (as groups and individuals) already know and can do and then find ways to encourage them to build on and reshape that knowledge. Their students, of course, have their own agendas. I think that the number 2,3 and 6 are the most appropriative for our country and our mentality. Thanks for such informal explanation. Nevertheless, the big part of the successful teaching and, of course, learning is the quality of the teacher. So, first of all, we need to improve our educators base. Number 1, teaching as content delivery, by Nuremberg Funnel, is the predominant in most rural schools in Nigeria, which is the major cause of poor achievements and retention by students, evident in the students poor performance in external exams. This article is highly informative. Mr. Dubberly, please can you provide a reference list? Also, there has been ongoing discourse categorizing models as either positivist or constructivist. How might the 10 models be accommodated by such an organizer? A very interesting article. My question is in two lines: 1) Which of these models do you understand is the one that best applies to the education of the elderly? 2) If you currently have a line of work oriented senior or “Fourth Age”. I appreciate your response.